If you’ve tried to paint white clouds in watercolor, you know that the trick is to Not paint the clouds, but instead, paint and “feather” the sky around the clouds, and the shadows of the cloud bellies, etc. 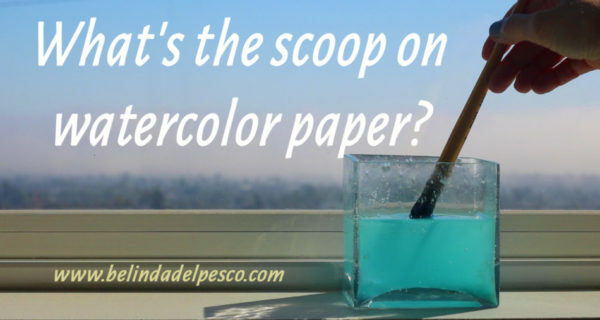 The white of your paper represents the clouds, so your brush and hand have to be restrained to leave areas clean and clear. I think this is the biggest challenge in white cloud painting with watercolor. Painters see everything in paint, and color choices and values, but when painting white or bright reflections in watercolor, the painter has to stack strategies that will preserve the white of the paper in a way that looks natural, and not like a cut-out from the pigments around it. If you look for inspiration and tutorials online, you could easily fill a month with watercolor cloud painting adventures, and I recommend doing that if you’d like to harvest an arsenal of approaches for all your future cloud paintings. The moral of the story on cloud painting is that there are All Sorts of Ways, and none of them are wrong, or better than the others, because it’s ultimately a matter of artistic preference and taste. If I assembled a grid of 20 different white cloud and sky watercolors (pretend I did that, and imagine it), I bet you a dollar and a donut that everyone looking at the grid would know they were ALL cloud paintings, no matter the skill level of the artist. We know clouds, and most of us are fascinated by their majestic beauty. The trick is to learn how to paint white clouds in watercolor in a way that leads to YOUR happiness with the results. I painted this little cloud study above without 1) researching, 2) practicing or 3) having a plan, [durrr] and that’s quite apparent in the finished piece! I looked at the painting the next day, and pondered a remedy-series of cloud studies in watercolor, so I could learn a thing or two. I don’t paint clouds often, but after looking for lessons to improve my approach, I found all sorts of help online and on my book shelves. To save you from going down the painting-white-clouds-in-watercolor-hole in a willy-nilly fashion like I did, I’ve assembled some resources for you below. Peter Sheeler has assembled a whole series of cloud and sky painting tutorials in watercolor, and you can see them here. Jennifer Branch demonstrates an expanse of blue skies and white clouds in a landscape painting in fifteen minutes in this video. Peter Wooley explores the effectiveness of lifting clouds out of the watercolored sky with tissue here. He makes a point to use a sturdy paper with good sizing when trying this technique. Jeremy Ford demonstrates a cloudscape over a shore using a controlled wet into wet technique with pre-mixed pools of pigment here. Steve Mitchell demonstrates a glowing sunset sky with clouds in shadow, so it’s less of a preserving-the-white of the paper technique, and more of a value-control exercise. Have a look here. Susan Herron makes sky and cloud painting look Flick-of-the-Wrist-Easy, and she talks about letting the paint do the work, why she loves French Ultramarine Blue for the visible granulation, and how using a hair dryer to expedite drying layers too soon might not be a good idea in a sky watercolor. Good morning, handsome! A monarch chrysalis I found on our deck was brought into the house, and kept safe and sound on a pot of milkweed, till he eclosed and left us all speechless with his beautiful transformation. Paper over Pixels? No Problem. Paying attention to the way light illuminates, and shades the curves on a cotton ball cloud. Also noticing that sky will likely peek through the wispy edges. And the greenery in my garden is reflected in the lower right edge of the “cloud”. Do you paint white clouds in watercolor? How about dark, richly bruised clouds staggered in orange and pink sunsets in watercolor? Who are your mentors and best inspirations for painting clouds and skyscapes in watercolor? If you have a few helpful resources, please leave them in the comments so we can help each other out. Clouds can stop traffic, and halt conversations with fingers pointing towards jaw-dropping beauty. A pile of cumulus clouds can cause spontaneous moments of silence to absorb their ephemeral shapes and colors. A high track of cirrus clouds can inflate the baffles on our sense of wonder and mystery. Cumulonimbus masses warn us about bad weather coming our way. Maybe it’s our duty as artists to remind people to look at the sky every now and again by trying our best to paint it well. What do you think about that? P.S. I should add John F. Carlson’s excellent book Carlson’s Guide to Landscape Painting to my list of books above, since he has an entire chapter on clouds, and so much of his wisdom is easily digestible and immediately applicable. I got my well-worn, often turned to copy on Amazon for about $10 here. As a poet, I’ve realized that one of the most important things I do is give people words, images, metaphors and stories to describe the world of their daily experience. I too undertook a “quest’ for clouds not long ago… and indeed it can be exhaustive … some of the links you suggested i actually had done… and i am about to “teach” a Watercolour session soon and … have never considered myself an expert on the subject … my “cop out” is that the sky … is a supporting character to the main event of your focus… the barn… the field… and so most of my skies are … wimpy …it has given me cause to … review some of your extra links and encourage more interesting skies! Thanks ! Hi Carla, I’m glad you’re interest in “un-wimping” your skies and clouds is renewed. I am the queen of talking myself off the mountain hike of This-Is-Hard. Years ago, a yoga teacher trying to get me to stand on one foot – and hold Vrikshasana told me “If it’s hard to do, that just means you need to do it more to strengthen your weak parts.” Boy, was she right. I’m looking at clouds this week with much scrutiny. I wish you leaps and bounds of success in your teaching and your own mastery. Thank you, Belinda. So many wonderful tips and resources in this post and inspiration to try to paint clouds in watercolor! I simply enjoy your posts so much. Your timing is perfect as I’m really trying to figure out this cloud thing. I’ve photographed so many seasonal skies here in the Midwest that I want to paint. Thanks for the tips! Hi Linda, I bet the cloudscapes you’ve captured in the midwest are just stunning! Yayy for you to launch a cloud painting campaign. I hope you have so much fun, and the results of your experiments lead to a solid feeling of accomplishment in your practice! Thank you for your lesson and valuable information. I am just getting back into watercolors. Good timing. Hi Bob! I just heard from Diane Saturday night that you’re getting back to watercolors, and I’m so glad to hear it! I hope some of the colorful coastal cloudscapes this Fall make it into some of your work. See you soon! Thank you for revealing all the different ways to approach clouds and how using RESTRAINT is so important! 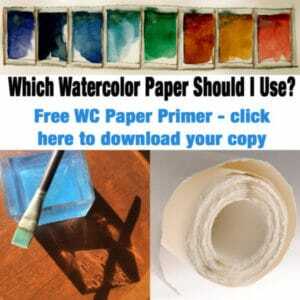 I have been guiding a group of retirees with watercolors, and this particular post will be very helpful to show that there are many ways to approach this. Your work is so lyrical and beautiful. Again, thank you! Hi Belinda, thank you for the wonderful tips about painting clouds! Wow! Thanks for all those links! I love You Tube painting videos. Your visual of using a cotton ball to point out cloud details is brilliant.